Ongoing advancements and adoption of advance technology in day to day life, has tremendously evolved the task of cooking. The importance of flame-less, temperature controlled cooking has increased with the growing trend of open kitchen facilities, especially for commercial spaces like hotels, eateries at shopping malls, restaurants, and others. As the operation of induction cooking top involves induction technology, which enables energy transfer directly onto the cooking pan instead of dissipating the heat. This results in quick heating as well as cooking, thereby saving time and energy consumption. Rising competitiveness and strategic investment adopted by market leaders are expected to show progressive growth for commercial induction cooktop in the near future. For instance, in 2017, Panasonic introduced commercial cooktop which is compatible with all metal cookware, including aluminum and copper. With the launch of a product like this, the peripheral of applications are expected to widen. Moreover, other key vendors such as The Vollrath Company, CookTek, True Induction, APW Wyatt, and Garland Group in the induction cooktop market are continuously innovating on designs, features, and specifications such as improvement in touch-sensitivity of control panels and embedding infra-red sensors in commercial induction cooktop. Owing to the growing adoption of the commercial induction cooktop, the market is expected to witness decent growth in the coming years. The global commercial induction cooktop market valued USD 1.38 billion in 2015 and is anticipated to grow at a CAGR of 7.50% during the forecast period. Geographically, Europe is the dominating region for global commercial induction cooktop market in 2016 and is expected to dominate over the forecast period. Growing demand for energy-efficient and time saving cooking method is likely to contribute in the growth of Europe commercial induction cooktop market. Europe commercial induction cooktop market is expected to reach USD 0.87 billion by the end of 2024. Moreover, high productivity, safe control panels with improved compatibility of commercial induction cooktops is boosting the growth of the commercial induction cooktops business in North America and Asia-Pacific region. North America region accounted for 30% revenue share of commercial induction cooktops market in 2016. Asia-Pacific commercial induction cooktops market is anticipated to reach USD 0.71 billion in 2024. The growing inclination towards the use of energy-efficient products with high productivity and superior design is one of the key drivers for the global commercial induction cooktop market. Growing trend of flame-less cooking, modern kitchen décor, and ease to use in any environment are some other factors fuelling the adoption of commercial induction cooktops. 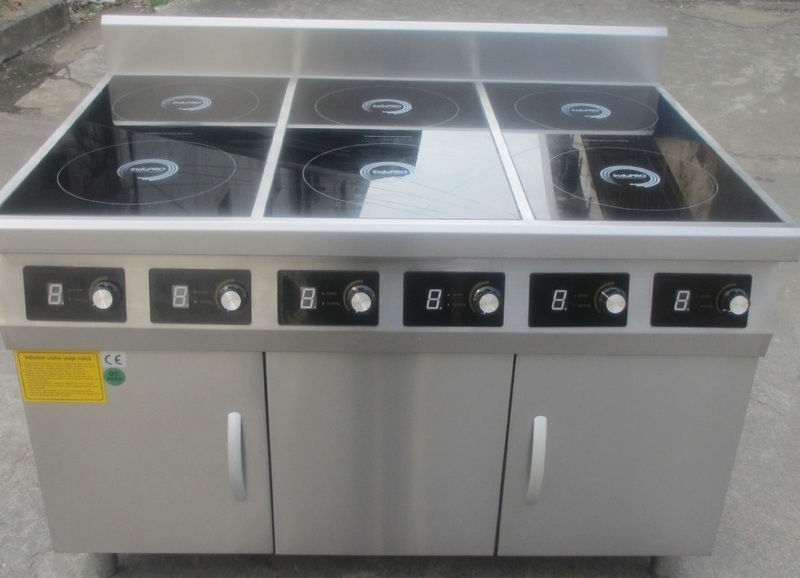 On the other hand, the prevalence of conventional gas burners, high initial cost and incapability of such cooktops to function with aluminium, copper pans and glass cookware pose as the restraining factors for the growth of the global commercial induction cooktop market. However, rapid urbanization, increasing awareness, and relatively safer use in commercial as well as closed space are aiding the global commercial induction cooktop market to garner the untapped opportunities.